A fine map of the United States showing the California Gold Region. Cartographically there is much of interest, especially in the western states where territorial development was still in progress. Washington and Oregon extend eastward as far as then the Rocky Mountains. The vast Missouri Territory extends from the Rockies to the Missouri River and south to the Platte River. Utah Territory and extends from California to the Rocky Mountains and the Great Basin is recorded as 'Fremont Basin.' 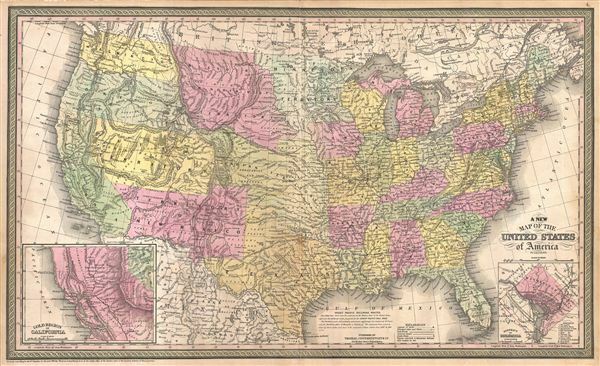 New Mexico extends from California to Texas and, though this map was issued in 1853, one year after the event, the Gadsden Purchase is nowhere in evidence. American Indian groups are identified throughout, as are mineral deposits, topographical features, pots of interest, and navigable river ways. Very good condition. Original centerfold. Bank on verso Wide clean margins.